The US government shutdown has ended 16 days after it shuttered federal agencies and put nearly one million workers on mandatory leave. An eleventh hour agreement spared a potentially catastrophic debt default and promised future negotiations. 15:00 GMT: Although Congress has agreed to raise the $16.7 trillion debt ceiling, ending a 16-day partial government shutdown, the relief rally that started on Wall Street on Wednesday has largely petered out. The dollar was down sharply and stock markets drifted lower. The key indicator of business activity in the US, the Dow Jones Industrial Average, lost 0.71 percent, with S&P slipping 0.19 percent and NASDAQ declining 0.18 percent. 14:07 GMT: The National Zoo in Washington will turn its Giant Panda cam back on, now that the shutdown is over, by about 10 am local time on Thursday. The zoo will also be posting pictures and video of the two-month-old female giant panda cub on Flickr and YouTube. 12:05 GMT: China, United States' biggest creditor, has welcomed the end of the shutdown, through a statement voiced by its foreign ministry. 04:30 GMT: US President Barack Obama has signed a compromise bill to end the US government shutdown after 16 days, and raise the debt ceiling just hours before the October 17 deadline. The legislation funds the government through to January 15 and lifts the $16.7 trillion debt ceiling until February 7. 03:23 GMT: The Office of Management and Budget has indicated that employees currently on furlough should plan on going to work tomorrow. Representative Gerry Connolly (D-Va.) told the Washington Post the woman is well-known and universally liked. “I think there’s a lot of sympathy, because something clearly happened here,” Connolly said. She was escorted off the House floor. 02:28 GMT: The House of Representatives voted to pass (285-144) the Senate's bill to fund government and end the government shutdown, along with raising the debt ceiling. The legislation now heads to the president for his signature. 01:50 GMT: President Obama is set to deliver remarks on the need for bi-partisan efforts to deal with fiscal issues, citing the 11th hour deal in Congress to fund government and avert a debt default, though the House had yet to actually pass the Senate's bill. 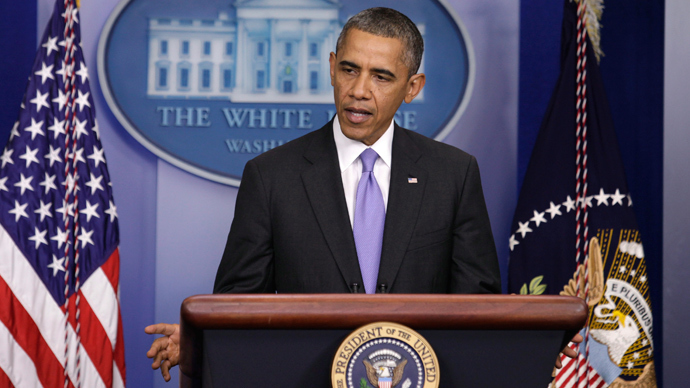 Addressing reporters after a successful Senate vote, Obama indicated he would address the matter again. "I'll have more to say about this tomorrow, and I've got some thoughts about how we can move forward in the remainder of the year, stay focused on the job at hand." 00:30 GMT: The US Senate has passed a bill that will raise the debt ceiling and end the government shutdown by a vote of 81 to 18. The legislation now travels to the House of Representatives, where it is expected to pass. Senators Rand Paul, Marco Rubio and Ted Cruz were among the 18 lawmakers who voted to continue the shutdown and risk US default. President Obama said in a statement after the Senate vote that he would sign the legislation "immediately" after passage by the House. "Hopefully next time, it won't be in the eleventh hour. We've got to get out of the habit of governing by crisis,” Obama said. 21:30 GMT: The Senate is expected to vote on legislation to raise the debt ceiling and reopen government at around 22:00 GMT (6pm ET) according to an aide cited by Reuters. The House would then likely debate and pass the Senate's bill later on Wednesday, and send it to President Obama to sign into law. If the bill passes, as is widely expected, furloughed government employees could be recalled back to work as soon as Thursday. 20:45 GMT: The S&P ratings agency declared Wednesday the shutdown has subtracted $24 billion from the US economy, cutting 0.6 percent from the fourth quarter GDP growth. While the shutdown is widely expected to end after a congressional vote Wednesday, S&P warned that the temporary solution lawmakers have agreed upon could pose a threat to the upcoming holiday spending season. “If people are afraid that the government policy brinksmanship will resurface again, and with it the risk of another shutdown or worse, they’ll remain afraid to open up their checkbooks. That points to another Humbug holiday season,” the S&P release stated. 20:33 GMT: US financial markets surged Wednesday as word spread that the US will, by all accounts, end the government shutdown and avoid a debt default. The Dow rose by 205 Wednesday, with the Standard & Poor’s 500 Index (SPX) 1.4 percent to 1,721.47 by Wednesday afternoon in New York. The SPX has recovered from its 4 percent decline and is up 21 percent in 2013. 20:25 GMT: Heritage Action for America, the conservative lobby group, opposes the Senate bill and warned politicians that it would closely watch the House vote Wednesday night. “Unfortunately, the proposed deal will do nothing to stop Obamacare’s massive new entitlement from taking root – radically changing the nature of American health care,” the statement read in part. 20:19 GMT: The US Chamber of Commerce is encouraging lawmakers in the Senate and House of Representatives to vote “yes” Wednesday on a bill that will temporarily raise the debt limit and end the government shutdown. The Chamber also warned that a default would not force Washington into spending less, it would only worsen the long term economic situation. “The consequences to the US economy and the American business community of a default are too extreme to be allowed to occur,” Bruce Josten, the senior most lobbyist in the Chamber of Commerce, said in a statement. 19:40 GMT: House Speaker John Boehner (R-Ohio) confirmed that Republican representatives have no plans to block the bipartisan bill and told reporters that he expects the government to be up-and-running as early as Thursday morning. 17:00 GMT: White House press secretary Jay Carney said during an afternoon briefing that the president applauds the bipartisan agreement reached earlier this day and said Mr. Obama believes the deal will indeed reopen the government and remove the threat of economic brinksmanship. The president will reportedly sign the deal if it makes it out of the Capitol and to the Oval Office. 16:18 GMT: A bipartisan compromise has been reached in the Senate to raise the debt limit, US Senate majority Reid has said. Senate Minority Leader McConnell has confirmed the deal. 15:35 GMT: Dow jumps 200 points, or 1.3 percent, to 15,370 in late morning trading amid reports that a deal on the debt ceiling and government shutdown is near. Rates on short-term US government debt also fell as investors became less nervous about a possible default, Associated Press reports. 15:30 GMT: Latest reports indicate that House Republicans are still unsure if they will move first on a bipartisan bill drafted in the Senate that would finally end the government shutdown. Rep. Kevin McCarthy (R-California) told journalists with Reuters on Wednesday that "no decisions have been made yet," but earlier reports suggested that the bill could be approved by the House today, then sent to the Senate where approval is all but certain. 14:28 GMT: The House will vote first on the negotiated Senate proposal to lift the debt ceiling and end the government shutdown, the Politico blog reports. In case the bill passes in the House, the Senate would be required to do only one procedural roll call with a 60-vote threshold to advance the bill toward final passage in the Senate. However, in order to pass, the legislation must garner the support of at least 117 Republicans – a number “unlikely” to be reached, according to senior GOP sources cited by the blog. 14:00 GMT: US Senate leaders holding talks on legislation to raise the country’s debt limit and reopen government agencies are “very close” to striking a deal, which could be announced soon, a senior Senate Democratic aide told Reuters on Wednesday. There are also “indications” that the Senate might be able to move quickly to pass it, the aide said on condition of anonymity, adding that talks are underway to try and move legislation quickly through the House of Representatives as well. 23:50 GMT: The Senate has restarted negotiations to find a solution ahead of a quickly approaching deadline to avert a US debt default, as well as reopen government now that a widely expected vote at the House has collapsed. “Given tonight’s events, the Leaders have decided to work toward a solution that would reopen the government and prevent default. They are optimistic an agreement can be reached,” said Don Stewart, spokesman for Senate Minority Leader Mitch McConnell. Senate Majority Leader Harry Reid and McConnell had been working on an agreement, which was put on hold while Republican House Speaker John Boehner attempted to group enough supporters to pass their own plan. Senate Democrats are still hoping to end a $63 per-person annual tax on most health insurance plans, while Republicans want the Dept. of Health and Human Services to verify income of those seeking Obamacare subsidies, reports Politico. As it stands, the tentative Senate deal would require a bicameral budget conference by Dec. 13, while avoiding a debt default by raising the ceiling until Feb. 7 and ending the government shutdown with funding through Jan. 15, when more sequester cuts will come for the federal government. 23:10 GMT: FreedomWorks, the conservative libertarian group founded by David Koch, and the influential conservative lobby Heritage Action for America have both encouraged Republican lawmakers to vote against raising the debt ceiling, arguing that such a bill would not go far enough in stopping President Obama’s federal health care program. Before the House vote scheduled for Tuesday night was cancelled, Heritage Action warned politicians the debate would be a “key vote” that will help the conservative group decide if it will fund a lawmakers’ campaign in the next mid-term election. The House of Representatives will not hold any votes regarding the government shutdown or federal debt limit Tuesday night, House Rules Committee Chairman Pete Session told reporters. Speaker John Boehner's office said Republicans would continue to seek a resolution Wednesday. 21:54 GMT: President Obama has said that he would veto any legislation seeking to raise the debt ceiling while also cutting health subsidies for congressional officials. The announcement comes just hours before the Republican-controlled House of Representatives is expected to vote on a measure that would do just that. 21:47 GMT: Fitch credit rating announced Tuesday that it was evaluating whether to place US credit rating on negative due to lawmakers’ inability to raise the debt ceiling ahead of a Thursday deadline. The financial service said the US’ rating remained at AAA, which it held onto through the similar fiscal crisis of 2011 despite a AA+ downgrade by S&P, but the announcement meant that evaluation could soon be downgraded. 20:50 GMT: House Republicans will attempt to pass a revised plan Tuesday that seeks to reopen government agencies and raise the debt ceiling before the US defaults later this week, Representative Devin Nunes told reporters. Democrats criticized the proposal for only seeking to extend the federal government’s ability to borrow money until February 7. Upon leaving Speaker Boehner’s office Nunes told reporters that the Republican plan would not require the formation of a negotiating panel to work on a viable long-term solution, but a proposal being negotiated by Senate leaders would require such a panel to have such recommendations by December 15. Nunes went on to say he believes the revised Republican plan would win enough votes for passage, although that confidence did not necessarily stretch through Congress. “It’s very, very serious,” said Senator John McCain, a Republican representing Arizona. In a clue as to the party’s current strategy, GOP Rep. Womack told reporters that Republicans only intend to fund government until December to allow for more time to fight the Affordable Care Act's contraception mandate prior to January 1st. 15:40 GMT: The White House rejected a plan offered by House Republicans on Tuesday concerning the government shutdown and raising the debt ceiling deadline. “The President has said repeatedly that Members of Congress don’t get to demand ransom for fulfilling their basic responsibilities to pass a budget and pay the nation’s bills. Unfortunately, the latest proposal from House Republicans does just that, in a partisan attempt to appease a small group of Tea Party Republicans, who forced the government shutdown in the first place," White House spokeswoman Amy Brundage said in a statement. 14:46 GMT: Senate Majority Leader Harry Reid says he is confident that Democrats and Republicans can reach a comprehensive fiscal agreement this week that avoids the default on debt and other obligations. “There are productive negotiations going on with the Republican leader,” Reid said, as cited by Reuters. “The Republican leader and I will keep our members informed as to how negotiations are going. And I express my appreciation to everyone for their patience,” he added. 14:05 GMT: House Republican leaders are reportedly pushing a bill on Tuesday to reopen the government and avoid financial default. Speaker John Boehner and other Republican leaders have outlined a bill that would keep the government running through to January 15 and raise the debt limit on February 7, officials told AP on condition of anonymity. The bill would also suspend a tax on medical devices for two years, require income verification for subsidies to receive health insurance and eliminate health care subsidies for the president, vice president, his Cabinet and members of Congress. Their proposal is separate to the deal emerging in the Senate. 10:47 GMT: Squirrels are feeding on tomatoes from the First Lady’s White House garden – this comes after gardeners stopped working over the government stalemate. Since the shutdown, the gardeners have only been permitted to water the plants in the garden. 20:52 GMT: A bipartisan group of US senators are working on a tentative deal to fund the government through mid-January and extend borrowing authority through mid-February, a source familiar with the negotiations told Reuters. The arrangement would also include a new set of deficit-reduction negotiations to be held by the end of the year. Both Democrat and Republican lawmakers said they were encouraged by Monday’s negotiations. 19:03 GMT: A meeting between Obama, Vice President Biden and congressional leaders from both parties has been postponed to allow Senate leaders more time, reports Reuters. “The president's 3:00 p.m. meeting with the bipartisan leadership has been postponed to allow leaders in the Senate time to continue making important progress towards a solution that raises the debt limit and reopens the government,” the White House said in a statement. White House officials said the postponement should be seen as positive, but there was no indication that the meeting would be rescheduled for later on Monday. 18:05 GMT: Senators are weighing a short-term government funding bill that will not extend past January 15. Spending would stay at current levels, reports Reuters citing a Senate aide. 16:51 GMT: If the Republican Majority in the House of Representatives can't resolve debt standoff, 'we stand a good chance of default,' said the US President Barack Obama. 16:50 GMT: US Senate Majority Leader Harry Reid said that he hopes to be able to present a new proposal to President Barack Obama at the meeting at White House. He and Senate Republican leader Mitch McConnell are set to meet with Obama at 3 pm ET (1900 GMT), along with House of Representatives Speaker John Boehner and House Democratic leader Nancy Pelosi. 16:40 GMT: US President Barack Obama and US Vice President Joe Biden will meet congressional leaders on Monday to discuss the impasse on how to extend the US debt ceiling and end a government shutdown, the White House said in a statement. Obama “continues to urge Congress to pass a bill that raises the debt ceiling and lends the certainty our businesses and the economy needs,” the White House said. 16:15 GMT: Military veterans taking part in the ‘Tea Party’ protests have torn down barricades at the World War Two Memorial in Washington and carried them forward to barricade the White House. Meanwhile riot police have arrived in front of the White House. 08:17 GMT: Truck drivers circled the capital to protest against President Obama, who they say is abusing the constitution. 23:47 GMT: After a conference with Obama, Harry Reid and other Senate Democratic leaders left, saying nothing to reporters. A party aide however told Reuters that they had agreed that talks should continue between Reid and Senate Republican leader Mitch McConnell. “But Democrats' position remained the same: Democrats are willing to negotiate on anything Republicans want to discuss as soon as we reopen the government and pay our bills,” the aide added. 20:18 GMT: Barack Obama is planning to meet Senate Democratic leaders at the White House later on Saturday to discuss the fiscal stalemate, the White House said. 02:04 GMT: Despite the growing hope that US lawmakers will find a way to end the shutdown, hundreds of cancer patients hoping to receive special treatment methods at the National Institute of Health have been rebuffed since October 1. Michelle Langbehn, who was diagnosed with sarcoma in April 2012 at age 29, has been on a campaign to raise awareness on how a game of politics is putting actual lives at risk. Langbehn, the mother a young daughter, has attracted over 120,000 signatures to her petition on Change.org/shutdown. She said that when she meets with Washington lawmakers next week she hopes to explain what kind of risk their taking. 01:39 GMT: The US Food and Drug Administration suspended all routine food safety inspections starting on Oct. 1, the beginning of the government shutdown, an agency spokesman told The Huffington Post. Without full funding, the FDA only inspects facilities it believes "present an immediate threat to public health." Normally, the FDA strikes deals with states to use their employees for a certain percentage of inspections, yet those contracts were also eliminated upon the shutdown. The absent inspections by state workers and those skipped due to furloughed federal employees combine to make about 73 missed routine inspections nationwide per business day, The Huffington Post reported. The FDA has oversight over 80 percent of the US food system. 00:52 GMT: Several states have worked out deals with the federal government to reopen national parks on a limited basis at the states’ own expense, the Associated Press reported. For instance, New York Gov. Andrew Cuomo said the state will shell out $61,600 a day to fund Park Service personnel in full to keep the Statue of Liberty open. Other iconic locations such as the Grand Canyon (Arizona), Mount Rushmore (South Dakota), Rocky Mountain National Park (Colorado) and Zion National Park (Utah) will open in the coming days based on various temporary agreements with Washington. 23:11 GMT: President Obama spoke with groups of about 150 business leaders and 25 state governors on separate phone calls Friday, giving both an update on talks with Congress to end the government shutdown and on negotiations to raise the debt ceiling by the deadline next week. "The president reiterated that his first order of business is to urge Congress to reopen the government and remove the threat of default, and then he is willing to engage with Congress on a long-term budget," the White House said of the call with business leaders. The governors call addressed the impact the shutdown was having on state budgets and the overall economy. "He argued that the prolonged shutdown is having adverse consequences on consumer confidence and businesses, and is hurting local economies across the country that rely on tourism at national parks and monuments," the White House said. 08:00 GMT: Starbucks, the world’s biggest coffee chain, announced on Thursday it would jump into the muddy waters of politics by asking its customers to sign a petition calling for an end to the US government shutdown that has left hundreds of thousands of federal employees off the job. The petition, which will be available at Starbucks’ 11,000 US locations beginning Friday, calls for reopening the government, paying off debts on time and passing a long-term budget plan by year’s end, AP reported. In addition to customers, Starbucks is trying to get the CEOs of the nation's largest corporations to sign. 09:15 GMT President Obama signed into law on Thursday legislation that was rushed through Congress to provide benefits for the families of soldiers killed in the line of duty, aid that was halted due to the shutdown of the federal government. The Defense Department sent shock waves through Washington by saying a law that Obama signed just before the shutdown 10 days ago maintaining payments to the military did not include the families of fallen soldiers, Reuters reported. White House chief of staff, Denis McDonough, went to work Tuesday night to work out a solution with Congress, spokesman Jay Carney said. Congress approved the legislation earlier on Thursday. At least five families of troops killed last weekend in Afghanistan were affected by the suspension, US Senator John McCain said. 23:04 GMT: No deal was reached on either the government shutdown or looming debt ceiling when lawmakers sat across the negotiating table early Thursday evening, officials said, conflicting an earlier report that the White House had outright turned down a deal. Republican Representative Paul Ryan said President Obama indicated neither yes or no to a Republican offer to temporarily raise the debt ceiling, and avoid what analysts have said would be a fiscal disaster. 20:19 GMT: The stock market was on track for its biggest gain since January on Thursday as stocks soared with the news that US lawmakers were discussing a deal that may keep the government from defaulting. The Dow Jones industrial average was up roughly 290 points, or 2%, in late afternoon trading, the Standard & Poor’s 500 index gained 2% and the Nasdaq composite index increased by 2.2%. Major US markets have slumped over the past two weeks as the ongoing shutdown has increased the risk of a government default. 03:01 GMT: The Federal Aviation Administration has recalled 800 of the over 3,000 aircraft inspectors who were ruled non-essential at the beginning of the shutdown to oversee the “most critical” aspects of airplane production, the FAA announced in a statement. Since October 1 FAA inspectors have not been able to perform random safety checks, analyze flight data for safety trends, or examine airline maintenance procedures. 02:53 GMT: The US Nuclear Regulatory Commission will have no choice but to close on Thursday due to the ongoing government shutdown, agency spokesman Eliot Brenner told reporters. The NRC is responsible for maintaining the safety of US nuclear plants, and will furlough 3,600 of its 3,900 researchers and engineers, although all resident inspectors at nuclear sites would remain on duty. Brenner also said enough staff will remain on hand to respond to emergencies but all other functions would be severely restricted. The agency’s daily reactor status and event report will not be available during the shutdown. 02:40 GMT: Influential Republicans in the House are considering a short-term increase in the US debt limit, a move that could potentially break the stalemate in Washington and save the US from what some fear would be devastating economic damage. Officials told the Associated Press Wednesday night that rank and file Republicans are expected to debate the issue Thursday before Speaker Boehner, and a small cadre will meet with President Obama in the White House. What, if any, conditions the bill would carry remain unknown, but the sources did say that raising the debt ceiling has taken precedence over resolving the shutdown among Washington lawmakers. 19:30 GMT: The military charity Fisher House Foundation will pay the standard $100,000 death gratuity to the families of the five US soldiers who have died since the shutdown began, and to relatives of any more troops that may die while it continues, Defense Secretary Chuck Hagel has announced. Earlier Obama asked Pentagon to find money to pay the soldiers' families the fee, which is traditionally used to cover the transportation of funeral expenses. 19:25 GMT: Obama will meet with 18 leading Congress Republicans on Thursday, including House Speaker John Boehner and Tea Party conservatives, Steve Southerland and Lynn Jenkins. The president will attempt to persuade the group to allow the debt ceiling to be increased, as the date it will be exceeded is nearing. "Nine days into a government shutdown and a week away from breaching the debt ceiling, a meeting is only worthwhile if it is focused on finding a solution," said Boehner spokesman Brendan Buck. 19:20 GMT: Barack Obama has said that he will veto a separate bill that would guarantee funding Federal Aviation Administration for the duration of the shutdown. The White House has rejected a sheaf of similar bills in the past week, calling instead for a fundamental resolution of the shutdown crisis. 18:08 GMT: The White House says it believes the US House of Representatives will "do the right thing" and Republicans will pass legislation to lift the debt limit and reopen the government, White House spokesman Jay Carney told reporters. President Barack Obama, meanwhile, has called on the Defense Department and White House budget office lawyers to find a way to pay death benefits to military families, which were cut off during the government shutdown, the White House spokesman said. Obama expects the death benefit problem to be fixed on Wednesday, Carney added. 15:00 GMT: Director of the CIA, John Brennan's statement indicating his decision to increase staffing levels during the 'funding hiatus' has come into effect. The decision was "because of the potential adverse cumulative and unseen impact on our national security from the now week-long furloughing of a significant portion of the CIA workforce," Brennan said in a statement released on Tuesday. "Keeping our staffing at the dramatically reduced levels of the past week would pose a threat to the safety of human life and the protection of property," he said. However, he added that the decision did not mean that the agency could recall all of its employees. 08:20 GMT: US politicians are "sucking the blood of their own people," Islamist militant movement the Taliban said in a comment on the ongoing US government shutdown. "The American people should realize that their politicians play with their destinies as well as the destinies of other oppressed nations for the sake of their personal vested interests," the Taliban, which fights against the US troops in Afghanistan, said. The insurgents accused "selfish and empty-minded American leaders" of using the hard-earned money of ordinary Americans to "lavishly spending the same money in shedding the blood of the innocent and oppressed people." The Taliban said the money should better be used to make peace. 03:45 GMT: The CIA will be recalling thousands of its furloughed employees on Wednesday, according to a statement put out by the agency’s director, John Brennan. The Tuesday notice issued to the agency’s workforce and cited by the Washington Post noted concern over the “potential adverse cumulative and unseen impact on our national security” due to furloughed employees across the agency. Meanwhile, other US intelligence agencies seemed to be following suit. A spokesman for the Director of National Intelligence, James Clapper, said that the recall of “some employees” had been authorized at the National Counterterrorism Center, the National Counterproliferation Center, the Office of the National Counterintelligence Executive and the National Intelligence Council. 03:30 GMT: One key bargaining chip Republicans have sought to use in government shutdown negotiations is refusal to raise the debt ceiling, a congressionally approved restriction on the amount of national debt that can be issued by the Treasury. If the debt ceiling is not raised by October 17 some economic experts have warned that the US would have no choice but to default on its loans. 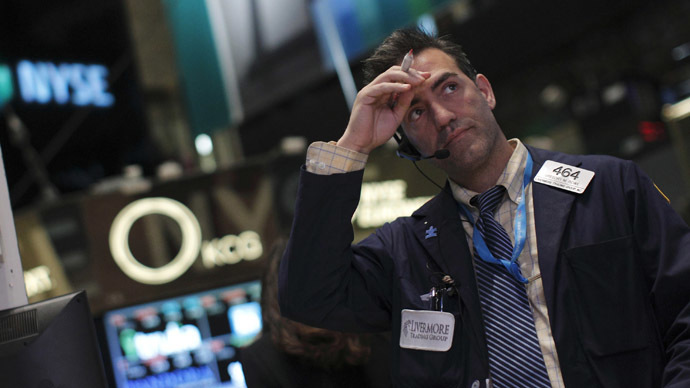 The most dire predictions point to a financial crisis with global implications. Increasingly, however, some Republicans, including Tea Party affiliated Senator Rand Paul (R-Ky.) and Representative Paul Broun (R-Ga.), now say that the prospect of a financial meltdown is grossly overstated. The issue, Paul continued, is merely one of framing. 03:15 GMT: The Arizona Food Bank has begun delivering food to families of government workers on mandatory furlough due to the government shutdown. The non-profit organization delivered 600 meals last Tuesday and returned for another trip, with organizers expecting to continue deliveries this week. The support came after a request from the Reverend Patrick Dotson of the Grand Canyon Community Church, who reminded the Arizona town that many government workers already struggle to put food on the table. 03:05 GMT: Based on the government shutdown, the US Department of Justice has asked a federal court to delay a case that will reveal more information about the NSA’s surveillance operations, the Associated Press reported. The case involves demands of Yahoo Inc. to offer up customer data. Government lawyers have said they will disclose secret documents on National Security Agency spying programs in the case. The Justice Department appealed to the Foreign Intelligence Surveillance Court to pause proceedings because all agency employees are not allowed to work during the shutdown except in emergencies involving safety of human life or protection of property. 02:01 GMT: The scientific community, which relies heavily on federal funding, has not been exempt from the belt-tightening incurred by the government shutdown. Benjamin Corb from the American Society for Molecular and Molecular Biology told RT the lack of funding, which began before the funding, is pushing researchers out of the US. “The United States remains the global leader in science and technology and innovation. However, as a survey we put together over the summer shows, one in five American scientists are considering leaving the country for better funding outside of our borders,” Corb said. 22:36 GMT: The effects of the ongoing government shutdown have stretched to Antarctica, where scientists preparing to study the melting ice sheets may be sent home. Researchers already work on a restricted schedule because of the small window of warm weather in Antarctica. Now, because of the lack of federal funding, an entire year of research could be lost. 21:49 GMT: The US has cancelled a military exercise with Japan just days after the two nations agreed to modernize their defense alliance for the first time in 16 years. Japan’s Ministry of Defense announced the news, which comes as a result of the federal government shutdown. The alliance included addressing concerns over North Korea’s nuclear program, cyber-security, terrorism, and other modern threats. “This is the only case that has been affected but if cancellations continue on other events, the impact would be substantial,” a ministry spokesman said. 21:35 GMT: President Obama would veto a bill passed in the House of Representatives that would create a panel of bipartisan lawmakers seeking to examine the US’ current debt situation, the White House said Tuesday. 21:21 GMT: President Obama has indicated that he would consider a temporary solution that would allow US lawmakers to extend the debt ceiling. Obama was asked Monday if he would be open to a short-term compromise with Republicans, allowing the two parties to agree on the debt ceiling before the US defaults on its debts, which is expected to happen on October 17 unless the two sides come together. In a press conference responding to the president’s remarks, Speaker of the House John Boehner said such a short-term deal would constitute an “unconditional surrender” by the GOP. "What the president said today was if there's unconditional surrender by Republicans, he will sit down and talk to us," Boehner said. "That's not the way our government works." 18:15 GMT: President Barack Obama asks the Congress to "lift these threats" over budget as in a press conference over the government shutdown. “If the Congress doesn't raise the debt ceiling America would not be able to pay its obligations for first time in 225 years,” he said stressing the current situation hurts the country's credibility. Obama added he will discuss the future of his Affordable Care Act with Republican opponents in the House of Representatives only once Congress re-opens the government. 16:25 GMT: An exclusive gym available only to members of Congress will remain open throughout the shutdown, an unnamed House aide told the ThinkProgress website, adding that the decision to keep it running came directly from the office of the Republican speaker of the House of Representatives, John Boehner. The towel service is unavailable, but US taxpayers are still paying for daily cleaning and maintenance of the gym, the source said. Meanwhile, the staff gym available to Congressional staff has been closed. 16:35 GMT: Republican leaders of the US House of Representatives have unveiled a proposal that would establish a bipartisan, 20-member committee to make recommendations on a debt limit increase and look at ways to rein in the country's deficit, Reuters reports. Under the proposed legislation, the Republican-dominated House would name 10 members to the panel, while the Democratic-led Senate would name the other 10. The panel would also make recommendations on a measure to fund the government for the 2014 fiscal year, ending a shutdown of federal agencies. 16:10 GMT: In a telephone conversation with Speaker of the House of Representatives, John Boehner, President Barack Obama said that he would be willing to negotiate with Republicans once the US government was reopened and the threat of a default was lifted, the White House said. Obama has urged the Republicans to allow a "timely up-or-down vote in the House to raise the debt limit with no ideological strings attached." "He noted that only Congress has the authority to raise the debt limit and failure to do so would have grave consequences for middle-class families and the American economy as a whole," the statement by the White House said. 15:43 GMT: US President Barack Obama held a phone conversation with House Speaker John Boehner about the government shutdown, reiterating that he was not going to negotiate with the Republicans. "The president called the Speaker again today to reiterate that he won't negotiate on a government funding bill or debt limit increase," Reuters reported Brendan Buck, a Boehner spokesman, as saying. 1:33 GMT: Approximately 3 out of 4 White House staffers have been furloughed as a result of the partial government shutdown, severally dampening the executive’s everyday operations. Of the 1,701 advisers, assistants, accountants and other service staff normally employed at the White House, only 450 are currently on duty, AP reports, citing President Barack Obama's budget office. The staff of 90 that usually tends to the president's residence has been cut to 15. In the absence of low-level assistants who have been dubbed “non-essential,” senior White House aides are now tasked with planning such events like planning Obama's off-campus events, scheduling meetings, sending announcements to the media and getting visitors cleared by the Secret Service. 11:40 GMT: Senate Democrats are set to try to pass a stand-alone measure to increase the debt ceiling later in the week, challenging Republicans to a filibuster showdown that could unnerve financial markets as the deadline to a first-ever default on US obligations draws closer, AP reports. Majority leader Harry Reid could unveil the measure, expected to provide enough extra government financing to last beyond the 2014 congressional and gubernatorial elections, on Tuesday, a spokesman said. It is likely that Democrats will push for $1 trillion or more in new borrowing above the current $16.7 trillion debt ceiling, which is expected to be reached Oct. 17. 01:00 GMT: The government shutdown was an eventuality prepared for months ahead of time by opponents of the Affordable Care Act, or Obamacare, according to a report by the New York Times, which provides a clearer picture of events leading up to the shutdown. Citing the involvement by a collection of groups including the Tea Party Patriots, Americans for Prosperity, FreedomWorks, the Club for Growth, Heritage Action and others aimed at young adults such as Generation Opportunity and Young Americans for Liberty, the investigation points to long-term financial backing of efforts to block implementation of Obamacare, with one of the largest benefactors being the billionaire Koch Brothers via the Freedom Partners Chamber of Commerce. 21:30 GMT: The latest polling suggests that neither Democrats or Republicans are scoring many popularity points in their handling of the government shutdown impasse, though a Washington Post-ABC poll published on Monday suggests Republicans are bearing a greater portion of the public’s ire: 70 percent of Americans now disapprove of how the GOP has handled Congressional negotiations, a significant increase from 63 percent the week prior. Pew Research polling also released on Monday found that 38 percent of Americans blame Republicans for the government shutdown, while 19 percent blame both parties and 30 percent blame President Obama in particular. Interestingly, Pew’s poll also reflects that supporters of both parties do not want to see their side compromise on a continuing budget resolution: 77 percent of Republicans thought the president should agree to changes in Obamacare, compared to just 18 percent of Democrats. Poll respondents reflected nearly the same percentages when that question was flipped, asking whether the GOP should compromise instead. 20:50 GMT: Private donors have stepped in to fund Head Start programs in six US states, which serve more than 7,000 children, during the continuing government shutdown. Philanthropists Laura and John Arnold will dole out $10 million in emergency funding to reopen the early childhood programs in Alabama, Connecticut, Florida, Georgia, South Carolina and Mississippi as soon as Tuesday morning, reports the Washington Post. Head Start was already subject to deep funding restrictions under mandatory sequestration budget cuts, the largest since the program launched in 1965, according to the nonprofit National Head Start Association. “They have selflessly stepped up for Head Start children to ensure their path toward kindergarten readiness is not interrupted by the inability of government to get the nation’s fiscal house in order,” said NHSA Executive Director Yasmina Vinci. Despite the generous injection of funds, Vinci noted that the programs will be unsustainable without government action. NHSA grants were due to be renewed on October 1st, the day the government shutdown began. 17:00 GMT: President Barak Obama said Monday on a visit to the Federal Emergency Management Agency (FEMA) that Congress should reopen the government debt issue as he suspects “there are enough votes there” to pass the legislation. FEMA employees had been recalled to deal with Tropical Storm Karen, which has since weakened and 100 of them have been sent home again. 16:20 GMT: The National Transportation Safety Board (NTSB) won’t send investigators to a fatal explosion and fire in Washington DC’s underground system because of the shutdown, The Washington Post reports. One man was killed and two seriously injured after what was believed to be leaking hydraulic fluid from a stationary vehicle was ignited by welding equipment on the Metro’s Red Line near Union Station. 16:15 GMT: US National Economic Council Director Gene Sperling said Monday that the White House would be open to a short-term debt ceiling increase in a last ditch attempt to stave off a potential default. Although he added that the White House and President Obama would prefer a long term-deal and that it’s up to Congress to set the amount of the increase. 16:00 GMT: The Department of Justice said on its website that while the AMBER alert program, which alerts communities to serious child abductions, has resumed work after being off-line because of the shutdown. 12:52 GMT: Farmers and livestock producers in the US Midwest are struggling to make critical marketing decisions without access to vital agricultural reports put out by the National Agriculture Statistics Service [NASS]. The reports, which detail such information as how to price crops, which commodities to grow and when to sell them — as well as track cattle auction prices – are no longer being produced as a result of the government shutdown. In fact, the NASS has not only stopped putting out new reports about demand and supply, exports and prices, but all websites with past information have also been taken down. "We have no clue what is going on in the market," Tim Peterson, who farms near Monument in northwest Kansas, told AP. "We see what is happening in U.S. domestic politics and this is not an easy situation. I think the fact that the US president did not come here is quite justified," Putin said at APEC. 14:29 GMT: US House of Representatives Speaker John Boehner told ABC’s ‘This Week’ that Republican lawmakers would never agree to a measure to raise the country’s debt ceiling without including conditions to curb deficit spending, what is dubbed a ‘clean debt limit’ in Washington argot. “I told the president, there’s no way we’re going to pass one. The votes are not in the House to pass a clean debt limit. And the president is risking default by not having a conversation with us," Boehner said. "We're not going down that path," he added. "It is time to deal with America's problems. How can you raise the debt limit and do nothing about the underlying problem?" 20:39 GMT: The Pentagon is ordering most of its approximately 400,000 civilian Defense Department employees back to work after being furloughed following the government shutdown. The move comes after speculations that the shutdown is posing a significant threat to US national security. 20:35 GMT: The Republican-led US House of Representatives unanimously voted to approve a bill which will see 800,000 workers furloughed during the ongoing partial government shutdown paid once the crisis ends. The 407-0 vote in the House was a rare moment of bipartisanship within the deeply divided lower house of Congress. 08:35 GMT: US Secretary of State John Kerry warns the partial government shutdown could weaken the United States’ global standing. However, he stressed to America’s “friends and foes” that the current crisis gripping Washington was a moment of “political silliness” that would pass. He further noted that the partial shutdown, which has crippled large parts of the federal government and locked thousands of govern employees out of their offices, had not diminished “one iota” US commitment to its Asian partners. President Barack Obama had planned to attend the summit of Asian leaders, but canceled his travel plans to remain in Washington and deal with the shutdown, now into its fifth day. Kerry is now heading the US delegation in the talks. 05:00 GMT: One of the services affected by the government shutdown is the National Space agency, which has just celebrated its 55 anniversary. George Abbey, Fellow in Space Policy at the Baker Institute of Rice University and former overseer of the International Space Station for NASA, told RT there will be consequences of this shutdown down the line. “There are missions that are coming up in four, five or six months. They are fairly critical missions – robotic flights that are going to the planets. They have launch windows that have to be maintained and if the workers are furloughed that work can’t be done,” Abbey said. 23:59 GMT: The Federal Emergency Management Agency (FEMA) has ordered furloughed government employees to return to work to respond to Tropical Storm Karen. A hurricane watch was in effect for Florida’s Gulf Coast as the storm made its way toward New Orleans, Louisiana with 50-mph winds and heavy rainfall. Tropical Storm Karen is expected to make landfall in Louisiana, where a state of emergency is in effect, by Saturday morning. “Based on legal requirements, and consistent with its contingency plan, FEMA has begun to recall currently furloughed employees necessary to serve functions of the agency to protect life and property as they prepare for potential landfall of Tropical Storm Karen,” White House press secretary Jay Carney said Friday. 23:52 GMT: Americans trying to enroll in the new federal healthcare program online will not be able to access healthcare.gov during off-peak hours beginning Friday, officials said. The site, which experienced technical difficulty almost immediately after it debuted on Tuesday, will still provide general information about Obamacare, but those seeking to sign up for healthcare will only be able to do so during the day. Officials said the site, which some media outlets suspected was intentionally overwhelmed with traffic by hackers, should be running without problems by Monday. 22:33 GMT: US officials are worried that the partial government shutdown will hurt the nation’s ability to impose sanctions against Iran and Syria. White House spokesman Jay Carney said Friday that the shutdown has reduced the staffing at the Treasury’s Office of Foreign Assets Control - the office responsible for punitive punishment - from 175 employees to 11. 20:59 GMT: Lockheed Martin announced Friday it would furlough 3,000 employees on Monday due to the government shutdown. The defense contractor, which admitted more furloughs are likely if the political standoff is not resolved soon, said it is losing business nationwide because of a moratorium on government orders. 20:52 GMT: Correctional guards watching Boston Marathon bombing suspect Dzhokhar Tsarnaev are among the government employees not receiving paychecks because of the government shutdown. Officials told WBZ Boston that they expect the employees will eventually be paid for guarding the former college student who allegedly carried out the most devastating US terrorist attack since 9/11, but that paychecks will not be forthcoming until the shutdown is lifted. “We can’t leave them alone. We can’t put up a closed sign at 5:00 and say we’ll be back. So we’re there 24 hours a day,” said Joe Gaucher, a correctional officer at Devens Federal Medical Center. 17:21 GMT: President Barack Obama would veto 10 government funding bills that the House will vote on, the White House said. "The administration strongly opposes House passage of piecemeal fiscal year 2014 appropriations legislation that restores only very limited activities," the White House said in a statement. 16:00 GMT: The US House of Representatives said it will not vote on a "clean" spending bill without conditions to end the government shutdown. The House also demands spending cuts in exchange for raising the government's borrowing limit. "I don't believe we should default on our debt," the House’s Speaker John Boehner said. "If we are going to raise the amount of money we can borrow, we ought to do something about our spending problem and lack of economic growth," he added. 03:40 GMT: The US Postal Service took to Twitter to remind customers that their mail delivery remains unaffected during the government shutdown as it does not receive any tax dollars. The USPS, which relies on the sale of stamps and other products, last year reported a $15.9 billion annual loss, triple that of its $5.1 billion loss the year prior. 02:59 GMT: Adam Jentleson, communications director for Democratic Senator Harry Reid, tweeted Thursday that Speaker of the House John Boehner worked with Reid for months to find common ground on a continuing resolution to keep the government open, only to have the discussions fall through. 02:41 GMT: The White House has announced President Obama will not be traveling to Indonesia and Brunei, the only remaining stops on his Asia trip, which had already been scaled back a day prior. "The president made this decision based on the difficulty in moving forward with foreign travel in the face of a shutdown, and his determination to continue pressing his case that Republicans should immediately allow a vote to reopen the government," said White House press secretary Jay Carney. Obama was scheduled to attend the East Asia Summit in Brunei and the Asia-Pacific Economic Cooperation summit in Bali, Indonesia. Secretary of State John Kerry will represent the US at both summits instead. "The cancellation of this trip is another consequence of the House Republicans forcing a shutdown of the government," added Carney. 02:24 GMT: Approximately 3,200 preschool students have been locked out of their Head Start programs, which provide education and emotional well-being services to low-income families, as a result of the federal government shutdown. While only four programs – located in Florida, Connecticut, Alabama, and Mississippi – have closed so far, another 11 were set to close Friday if government funding is not restored, a program spokeswoman told the Wall Street Journal Friday. 23:20 GMT: A revealing moment was inadvertently captured by a live microphone wired to Senate Minority Leader Mitch McConnell and Senator Rand Paul, who approached him to discuss details of the GOP’s messaging on the ongoing government shutdown negotiations. "I think if we keep saying 'we wanted to defund it, we fought for that, but now we're willing to compromise on this … I know we don't want to be here, we're going to win this thing, I think,” says Rand Paul, in reference to the Obama administration’s unwillingness to compromise on delays or modifications to the Affordable Care Act, or Obamacare, as a condition of funding government and ending the shutdown. "I just did CNN and I just go over and over again, 'We're willing to compromise. 'We're willing to negotiate.' I think, I don't think [Democrats] poll tested 'we won't negotiate.' I think it's awful for them to say that over and over again," Sen. Paul is heard to say. To which Sen. McConnell responds: "Yeah, I do too and I, and I just came back from that two-hour meeting with them and that was, and that was basically the same view privately as it was publicly." 17:50 GMT: The White House says it does not plan to circumvent Congress on the debt ceiling limit when spending presses up against it in the coming weeks. "This administration does not believe that the 14th Amendment gives the power to the president to ignore the debt ceiling," said White House spokesman Jay Carney at a press briefing. "Moreover, even if the president could ignore the debt ceiling, the fact that there is significant controversy around the president's authority to act unilaterally means that it would not be a credible alternative to Congress raising the debt ceiling,"
16:47 GMT: US Senate Democrats are to insist on bills to raise the debt ceiling unconditionally, according to Senate Majority Leader Harry Reid. "We will act on a clean debt ceiling," Reid told reporters. 15:25 GMT: Obama has given a speech in Maryland declaring that "if we screw up, everybody gets screwed up - the whole world will have problems," should the US default on its debt. He added that there would be no negotiations over the issue and that it would be "the height of irresponsibility" for the US not to pay its bills. Obama placed the blame squarely on the Republicans, and specifically House Speaker John Boehner, for the government shutdown, accusing Boehner of not wanting to "anger the extremists in his own party." He stated that all Republican resilience is doing is "making it harder for ordinary Americans to get by," and condemned an "obsession" with stifling the Affordable Care Act. "Since they've taken over the House of Representatives we're having one of these crises every three months," he said. He warned that the party could cause the US to "default on its obligations for the first time in history," and repeatedly highlighted the serious impact a potential economic shutdown could have. 15:15 GMT: The markets have begun the third day of the shutdown with a moderate fall, with the Dow Jones down 0.8 percent, Nasdaq down 1.1 percent and Standard and Poor's 500 down 0.9 percent within an hour and a half of opening. 15:10 GMT: IMF chief Christine Lagarde has declared that US lawmakers must agree to increase the government debt ceiling, which currently stands at $16.7 trillion, hundreds of billions below actual government debt, meaning that the state spending is being legally constrained. “The government shutdown is bad enough, but failure to raise the debt ceiling would be far worse, and could very seriously damage not only the U.S. economy, but the entire global economy. So it is ‘mission-critical’ that this be resolved as soon as possible,” Lagarde told students at George Washington University. 03:30 GMT: The continuing government shutdown has called into question whether the Special Supplemental Nutrition Program for Women, Infants and Children, or WIC, will be able to continue supporting the more than 8.9 million mothers and children under five that rely on its vouchers for food, including infant formula. The USDA has estimated that most states can continue WIC operations for only “a week or so.” The department’s Food and Nutrition Service has a $125 million contingency fund, as compared to the $7 billion that is annually appropriated to the program. 01:50 GMT: Republican lawmakers indicated on Wednesday the possibility that the ongoing battle to pass a budget bill and end the government shutdown could continue and meld into negotiations to raise the debt ceiling. The debt ceiling, or rather the borrowing limit for the US, must be raised by October 17 in order for the country to comply with its financial obligations. “The [budget bill] is now part of the debt ceiling fight and we may see a shutdown that extends to mid-October,” said a veteran Republican operative to the Washington Examiner newspaper. 01:15 GMT: President Obama has scaled back an upcoming trip to Asia due to the government shutdown. Planned stops in Malaysia and the Philippines were scrapped so the president could return to Washington. Obama is scheduled to depart on Saturday for Bali, Indonesia for an APEC Economic Leaders' Meeting. Secretary of State John Kerry will instead be traveling to the Philippines in the president’s place. National Security Council spokesperson Caitlin Hayden pointed to House Republicans for forcing a shutdown of the government. "This completely avoidable shutdown is setting back our ability to promote U.S. exports and advance U.S. leadership in the largest emerging region in the world,” said Hayden. 23:58 GMT: The House of Representatives passed two partial spending bills Wednesday, despite a promise from the Senate that the legislation will not clear the upper chamber. The bill to fund the National Park Service passed by a 252 – 173 margin, and the bill to fund the National Institutes of Health passed 254 – 171. The White House has said it will veto both bills. 23:05 GMT: Just following a meeting with Congressional leadership at the White House Speaker John Boehner addressed reporters, saying that no deal had been reached on ending the government shutdown. "We had a nice conversation, a polite conversation," said Boehner. The Speaker also reiterated his desire to see Congress initiate a “conference” to hammer out a budget deal on a short-term continuing resolution to fund government, which Democrats have so far ruled out while adding that no such conference had occurred prior to Tuesday’s shutdown. “They keep moving the goalposts,” said House Democratic Leader Nancy Pelosi, emerging from that same meeting. “I’m glad it was held, we had some candid discussion,” added Pelosi. 22:15 GMT: The ongoing government shutdown has left individuals identified as delinquent by the Internal Revenue Service without the resources necessary to defend themselves against potential asset seizures, or levy, according to tax professionals cited by Reuters. "The IRS can levy, but we can't get the help to stop the levy," said Diana Leyden, director of the low-income taxpayer clinic at the University of Connecticut. "This is a real problem." IRS tax collectors currently pursuing cases against both individuals and businesses are still working despite the shutdown, but IRS staff that normally would assist taxpayers in their defense from collectors -- Taxpayer Advocate Service staffers -- are all furloughed. Experts told Reuters that IRS levies can often be stopped prior to seizures, but only when help is available. 20:40 GMT: President Obama ruled out negotiating with Republicans on any budget issues until Congress ended the government shutdown. During an interview with CNBC interview Obama reiterated his exasperation with lawmakers that were obstructing a “clean” continuing resolution to fund government based on opposition to elements of the Affordable Care Act, or Obamacare. "Am I exasperated? Absolutely I'm exasperated," said the President. Obama is set to meet with Congressional leaders at 5:30pm (21:30 GMT) -- House of Representatives Speaker John Boehner, House Democratic Leader Nancy Pelosi, Senate Democratic Leader Harry Reid and Senate Republican Leader Mitch McConnell will take part in that meeting. Meanwhile, the GOP may already have sufficient backers now to pass a “clean” budget resolution. "In the hours since the government shutdown, House Republicans have slowly but steadily been coming forward to say they're ready to pass a bill to fund the government with no strings attached," Huffington Post reports. 15:35 GMT: Obama has called Republican and Democratic leaders to a meeting in order to pass a 'clean' bill in order to raise the US debt ceiling and reopen government, according to a white House official. They are currently convened and in discussions. The FBI website is ceasing to be kept updated and inquiries will not be responded to as the shutdown continues. 15:00 GMT: The US Army's Chief of Staff has stated that the shutdown "impacts significantly day-to-day operations". "The longer it goes on, the worse it gets. Every day that goes by, we are losing manpower, we are losing capability, so in my mind it is important we get this resolved," he told Reuters in a telephone interview from Germany. 14:30 GMT: The CEOs of Goldman Sachs, Citigroup, JPMorgan Chase, HSBC, Deutsche Bank, Morgan Stanley and others are attending a meeting with Obama, according to the White House. Among discussion topics on the agenda are the government shutdown and an impending deadline to raise the US debt limit. 10:05 GMT: President Barack Obama’s planned four-step Asian trip will be shortened due to the government shutdown, the White House said. He will still travel to Indonesia and Brunei, but will not go further to Malaysia and the Philippines, as he originally intended. Obama canceled trips to Asia twice in 2010, once to stay in Washington for votes on his health care law, and once because of an oil spill in the Gulf of Mexico. 06:12 GMT: According to the Malaysian government, Barack Obama has postponed his upcoming visit. The US president was due to depart for Asia later this week, on a working tour to four countries. But senior Obama adviser Dan Pfeiffer says the president may have to call off his plans, in light of the government shutdown crisis. 05:15 GMT: Global investors appeared unimpressed by the US government shutdown on Tuesday, as most markets closed in the positive. On Wall Street, the Standard & Poor’s 500-stock index closed 0.8 percent up, and the Dow Jones industrial average ended 0.41 percent higher. The NASDAQ index closed to 1.23 percent higher. The Nikkei 225 in Tokyo was up 0.2 percent by the end of the day. In Europe, the Euro Stoxx 50 index closed 1.2 percent up. 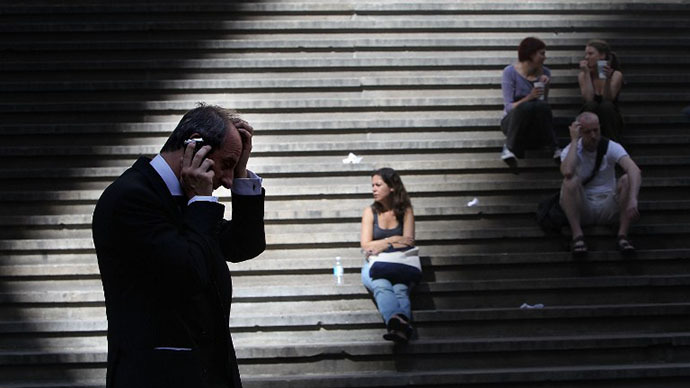 The FTSE 100 index in London was down, but only 0.2 percent. Bond and foreign exchange markets were also largely unmoved by the US government crisis. 04:49 GMT: The US government shutdown has scaled back the search for a missing woman whose last known location was Craters of the Moon National Monument, a federally funded preserve in Idaho that is now without most of its staff. 02:41 GMT: The Ku Klux Klan rally scheduled for October 5 at Gettysburg National Park was canceled Tuesday because of the federal government shutdown. The white supremacist group was granted a permit for a so-called First Amendment celebration by the National Parks service. That event will not take place because all the parks have been closed. National Parks officials previously defended the decision to allow the KKK, which terrorized African-Americans for decades with lynching’s and cross-burnings, to hold a rally at the site of a landmark Civil War battle, citing the freedom of speech granted in the US Constitution. 00:15 GMT: According to a memo put out by the Department of Health and Human Services the CDC will be “unable to support the annual seasonal influenza program, outbreak detection and linking across state boundaries using genetic and molecular analysis, continuous updating of disease treatment and prevention recommendations” as well as be forced to curtail “support to state and local partners for infectious disease surveillance” during a government shutdown. In addition, the Food and Drug Administration will be "unable to support the majority of its food safety, nutrition, and cosmetics activities. FDA will also have to cease safety activities such as routine establishment inspections, some compliance and enforcement activities, monitoring of imports, notification programs (e.g., food contact substances, infant formula), and the majority of the laboratory research necessary to inform public health decision making." 22:36 GMT: As Republican legislators and a Democratic President are stuck in democratic deadlock, ordinary US citizens are feeling the fallout. Iconic landmarks are closed bringing tourism to a standstill and having a drip-down effect on nearby businesses. “Most of the places that are most important for our business are closed today,” a local vendor tells RT’s Liz Wall. One family traveled thousands of kilometers from Arizona to see Washington’s sites, but have instead had to give their children a long lesson in the impact of government shutdowns. 21:30 GMT: President Obama would veto House Republican “piecemeal” spending bills as way to restart parts of the government, the White House says. "These piecemeal efforts are not serious, and they are no way to run a government," White House spokeswoman Amy Brundage said on Tuesday, noting the White House wants the House to pass a bill that would continue funding government without any unrelated policy measures attached. "The President and the Senate have been clear that they won't accept this kind of game-playing, and if these bills were to come to the President's desk, he would veto them," she said. 21:21 GMT: Sick patients who were scheduled to participate in research studies at the National Institute of Health’s hospital will have no other choice but to find treatment elsewhere during the government shutdown. The research hospital will be forced to turn away an estimated 200 patients, roughly 30 of them cancer-stricken children, in each week of the shutdown, NIH Director Dr. Francis Collins told the Associated Press. 21:15 GMT: Senate Intelligence Committee Chairwoman Dianne Feinstein (D-California) said Tuesday that the government shutdown could give terrorists an opportunity to launch an attack on the US. “The failure of this Congress to perform its most basic functions means our country is more at risk of a terrorist attack,” she said on the Senate floor. 21:13 GMT: The Obama administration’s prediction that there would be problems with HealthCare.gov, the site where Americans were encouraged to enroll for the new health care problem, came true on Tuesday. Site outages were reported almost immediately and some users were encouraged to return to the page at a later date if they did not want to brave the long wait times. 20:00 GMT: NASA.gov was down as a result of the government shutdown, though it had been displaying a notice stating as much before the site became entirely inaccessible. 19:49 GMT: US Senate Democratic leader Harry Reid says Republicans must agree to open the government before Democrats would consider their latest offer, Reuters reports. He spoke at the opening of the enrollment in health insurance exchanges. 18:45 GMT: The Mars Curiosity rover is among services deemed non-essential and has been furloughed. The rover is now in 'safe mode,' meaning it won't be fully shut down. However, it won't be collecting any new data either. 18:34 GMT: The Department of Defense has said that all sports at service academies have been temporarily suspended, according to AP. 18:23 GMT: The White House has rejected a Republican-proposed series of small funding bills, stating that it displayed an “utter lack of seriousness” regarding government funding. “If they want to open the government, they should open the government, and then we can negotiate about how we fund our budget priorities in the future,” White House spokesman Jay Carney told reporters. 18:15 GMT: Slate.com says it has obtained "an exclusive video of govt shutdown on NASA", whose site has been blacked out. The video, which is actually a trailer for a new Hollywood blockbuster movie, depicts an astronaut floating in outer space, played by actress Sandra Bullock, failing to establish a connection with NASA’s headquarter due to the agency’s closure. 18:04 GMT: US President Barack Obama promoted the ‘Obamacare’ health reform during his speech in the White House Rose Garden saying that the “opportunity is life changing” and the affordable care act "is settled and it is here to stay." Obama’s remark concerning shopping for insurance on healthcare.gov which makes it as easy as buying flights on Kayak, has sparked sarcastic comments on Twitter. 17:40 GMT: The Republican leaders suggested passing a series of non-controversial bills to fund certain functions of government, reopen individual federal agencies or programs at current spending levels, said a senior House aide as cited by Reuters. 17:10 GMT: US President Barack Obama has slammed the Republicans for their 'ideological crusade' on the government shutdown during a statement in the White House Rose Garden on the first day of the government shutdown. "They've shut down the government over an ideological crusade to deny affordable health insurance to millions of Americans," he said. Obama urged the lawmakers to vote to keep government operations running without conditions. "Many Representatives have made it clear that had they been allowed by Speaker (John) Boehner to take a simple up or down vote on keeping government open with no strings attached, enough votes from both parties would have kept the American people's government open and operating," he said. He said the shutdown happened because House Republicans "demanded ransom just for doing their job." 17:00 GMT: US veterans have stormed and occupied their World War II Memorial in Washington DC in protest. Many federal landmarks were closed as of Tuesday morning due to the Federal government shutdown. Twenty-four weddings that have been scheduled throughout October with permits in advance at such sites as the Jefferson Memorial and the D.C. War Memorial are now postponed indefinitely, said National Park Service spokeswoman Carol Johnson. She added that they can be rescheduled once the government reopens. 16:45 GMT: US citizens reacted to the shutdown on Twitter by posting photos without pants under the hashtag #NoBudgetNoPants with many vowing to join the act of protest. 16:30 GMT: A mid-October deadline to raise the US borrowing limit is a "forcing action" for a budget deal, said Senior House of Representatives Republican and Chairman on the House Budget committee Paul Ryan. "We have a debt limit coming ... in about two weeks," Ryan said at a news conference. "Most budget agreements in the past have always involved debt limit increases." 16:20 GMT: Visa application processing was halted for some 2,000 Iraqis who worked as interpreters or in other capacities for US forces, because the program granting the visas expired at midnight amid government shutdown. 16:00 GMT: The NASA website is also displaying a message explaining that it is not available in its usual format because of the shutdown. 15:25 GMT: The US governemnt shutdown is continuing to spark acerbic humor across the Twittersphere. 15:20 GMT: The Flight 93 National Memorial has been closed. 15:00 GMT: The US Department of Justice claims that it will be unable to meet Freedom of Information Act request deadlines in an ongoing lawsuit. Lawyers for the department filed a motion with a federal judge on Tuesday morning in the hope of pushing forward all deadlines pertaining to a suit brought by the Electronic Frontier Foundation, according to Politico. The lawsuit related to the harvesting of phone metadata. "Absent an appropriation, Department of Justice attorneys and employees of the IC are prohibited from working, even on a voluntary basis, except in very limited circumstances, including “emergencies involving the safety of human life or the protection of property," read the document obtained by the political journalism organization. 14:30 GMT: Partial closure of US state institutions could be a contributing factor to any potential reduction in the country's Fitch AAA rating. "The US government shutdown is not in itself a downgrade trigger for the sovereign's 'AAA'/Negative rating. However, it undermines confidence in both the budgetary process and critically in the prospect of the debt ceiling being raised in a timely manner to avert the risk of default on US sovereign debt obligations," read the letter signed by three spokespeople for the rating organization, reiterating its June 28 rating commentary. 14:04 GMT: The US Senate has rejected the latest House Republican request for negotiations on US government health spending, 54-46. The Senate voted with the majority in favor of tabling the request to make changes to Obama's health care law. The whitehouse.gov website now comes with a disclaimer. 13:55 GMT: US President Barack Obama labeled the shutdown “completely preventable” and that he would attempt to ensure that Congress restart its operations as soon as possible. “It should not have happened,” he added in the letter posted on the Energy Department website. Obama also complimented employees for their efforts. “You do all this in a political climate that, too often in recent years, has treated you like a punching bag,” he stated. 13:32 GMT: The US Department of Justice has asked for a stay of legal proceedings in an ongoing battle with both American Airlines parent company AMR Corp and US Airways Group Inc over their proposed merger. “Department of Justice attorneys and employees are generally prohibited from working, even on a voluntary basis,” the Justice Department said. The airline’s filing previously argued that a delayed trial would “knock the bottom out of this merger” as “two independent companies can be asked to stay in limbo for only so long before they need to make independent plans,” it said. 13:30 GMT: In a devastating blow to nature lovers around the world, the National Zoo's Panda Cam has gone dark. Both 'Panda Cam 1' and 'Panda Cam 2' are now displaying an 'error loading stream' message, as staff used to run them have not been deemed 'essential' during a government shutdown. 13:20 GMT: NASA has suspended all public activities, and will not be tweeting for its duration. Its 'Asteroid Watch' Twitter has also been affected, saying, "In the event of government shutdown, we will not be posting or responding from this account. We sincerely hope to resume tweets soon," late on Monday. 10:27 GMT: The Pentagon says it’s looking for ways to allow more of its civilian employees to keep working, despite the furloughs dictated by the government shutdown. According to Defense Secretary Chuck Hagel, America’s allies have voiced concern over whether they can keep counting on the US as a reliable military partner. 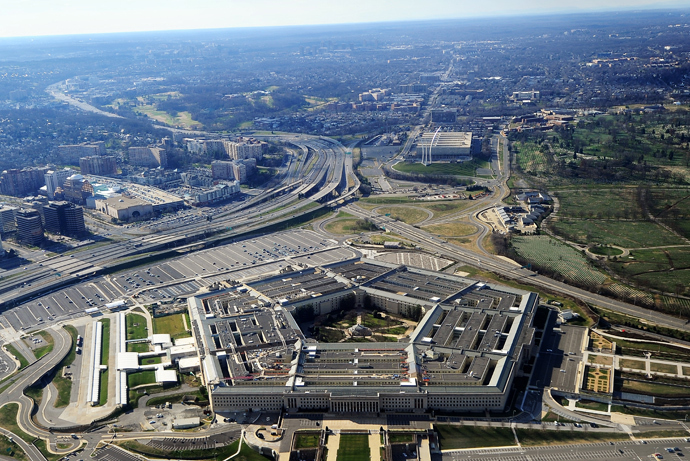 Half of the Pentagon’s 800,000 civilian workers are due to go on unpaid leave from Tuesday. 09:58 GMT: According to the latest CNN/ORC poll, the popularity of US lawmakers is at an all-time low. The poll puts Capitol Hill’s approval rating at just 10 percent, with 87 percent of respondents saying they disapprove of the job Congress is doing. President Obama’s approval rating has also fallen in recent weeks and now stands at 44 percent. 07:55 GMT: The British Prime Minister says the US government shutdown crisis should serve as a wake-up call for the UK. "It is a reminder to all of us that we need to have properly planned public expenditure systems, properly planned tax, properly planned arrangements for getting our deficit down," Cameron said at a Tory conference in Manchester. "I think we will see lots of reminders over the coming months, like what is happening in America, that it is absolutely vital that we grip it," he added, in an attempt to reinforce the need for his own government’s unpopular austerity measures. 06:50 GMT: Reaction to the failure to avoid the government shutdown is now pouring in from US lawmakers. "I do not support Obamacare, but a shutdown of the federal government will have [a negative] impact on our markets & the economy," said Sen. Mark Kirk (R-Ill). Barack Obama’s Democrats are placing the blame on the GOP. But the Republicans don’t agree. A cross-claim blame game has now ensued on Capitol Hill. “The fact that we have reached this point is a failure of leadership. I am disappointed by President Obama and Harry Reid’s refusal to negotiate in good faith to keep the government open. I will be working to get the government open,” said Congressman Brad Wenstrup (R-Ohio). 06:10 GMT: House Speaker John Boehner (R-Ohio) startled the media by wrapping up a news conference after just 73 seconds. He said the Republicans are committed to keeping the government open, but stressed that “we also want basic fairness under Obamacare.” When asked what he would say to the 800,000 Americans affected by the forced government shutdown, Boehner evaded a direct answer and walked out of the conference. 06:00 GMT: #governmentshutdown and #TheGovernmentShutdownBecause are now among the latest hashtags topping the worldwide trends shortlist on Twitter. GMT 04:44: The US government shutdown will cost the country's economy at least $300 million a day, according to analysts at IHS Inc.
GMT 04:20: The White House's budget office is now informing federal agencies about the government shutdown on Tuesday. Hundreds of thousands of US workers will be affected, as well as millions of Americans who rely on federal services. GMT 04:05: Majority Leader Harry Reid has announced a Senate recess until 13:30 GMT Tuesday. 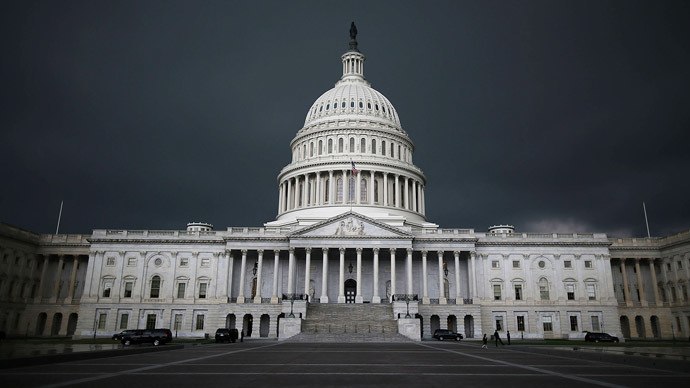 GMT 04:00: The House and Senate could not come to a deal to fund federal agencies ahead of the 04:00 GMT deadline, effectively beginning the first shutdown of the US government in 17 years. "I'd like to say good evening," said Pelosi, "but it isn't a very good one." Earlier on Monday Rep. Pelosi had offered a “compromise” with Republican Speaker John Boehner to secure the needed Democrat votes to pass a bill that set spending at sequestration levels, a proposition opposed by many in her caucus, including Minority Whip Steny Hoyer (D-Md.). GMT 03:03: Senator Reid called a Republican House plan to call for a conference “subterfuge” and refused such a motion until the GOP presented a “clean” continuing resolution, meaning a bill to fund government without any modifications calling for changes to Obamacare. GMT 02:49: Senior Republican John McCain indicated that House Republicans should present a clean bill to continue funding government, telling reporters that "Republicans will be perceived as blocking and as shutting down the government." "We can't win," McCain said to press ahead of a likely government shutdown. A clean continuing resolution to fund government "will happen sooner or later" added McCain. GMT 02:40: The Washington Post reports House Republicans will not attempt to pass any more bills to fund federal agencies ahead of the 04:00 GMT deadline, marking the first government shutdown since 1996. GMT 02:20: President Obama signed legislation on Monday evening to ensure that military personnel would continue to receive pay during a government shutdown. GMT 02:05: The House was thought to be working on a fourth CR to present to the Senate prior to the midnight shutdown deadline. GMT 01:41: The US Senate has voted down the House Continuing Resolution that proposed to keep the government open while delaying the Affordable Care Act’s individual mandate implementation, along with eliminating health insurance subsidies for Congress members and their members of staff. The continuing resolution -- defeated just hours before the midnight deadline to pass a short-term budget bill -- also denied the law’s federal subsidies to members of Congress, Capitol Hill staff, executive branch appointees, White House staff, the president and the vice president, who have to enter the law’s insurance exchanges instead. GMT 23:15: In a procedural vote, the House passed by a margin of 225-204 a rule to allow the House to skip normal protocol and advance its Continuing Resolution spending bill for a vote that includes measures that strip certain provisions of the federal health care law. GMT 21:08: President Barack Obama chastised House Republicans for letting opposition to the Affordable Care Act block a government funding bill as congressional inaction in the face a government shutdown continued.